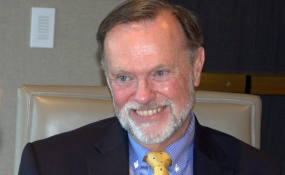 Washington, DC — In one of his first public engagements as the Trump administration's top State Department person on Africa policy, Tibor Nagy addressed the African Diaspora Youth Leaders Summit. The gathering joined Mandela Washington Fellows – a centerpiece of the Young African Leaders Initiative (Yali) – with counterparts from the Diaspora. Yali was launched by President Obama in 2010. The Mandela fellowship includes six weeks at a U.S. academic or training institute and networking with American leaders in the public and private sector. Nagy, a retired foreign service officer who served as ambassador to Guinea and Ethiopia, took office as assistant secretary of State for Africa on July 23 after Senate confirmation in June, ending a lengthy selection process. Before attending the Summit on 3 August, Nagy sat down with AllAfrica for his first interview since assuming office last month. He told us why, with so many pressing issues across Africa, he gave time to speak to a group of young people. The young leaders you're addressing are selected for their potential to contribute to society – many of them as entrepreneurs. What, in your view, is the importance of leadership – in governance, in business, and in other areas that determine whether a country or region will prosper and deliver advantages to their people? The simple answer is everything. The longer answer is: Where is that leadership going to come from? Everybody knows that Africa's population is going to double between now and 2015. As an example, Nigeria itself is going to go from 180 million to 360 million, replacing the United States as the world's third most populous country. Seventy percent of Africa by then will be under 30, so these folks are the ones who are going to be leading Africa into that future, across the board. I can't think of a better program than Young African Leadership Initiative / Mandela Fellows to spearhead and to be exemplary for the types of programs that we need to develop the leadership. I spent 22-plus years in Africa [primarily as a U.S. foreign service officer]. I was there voluntarily because I fell absolutely in love with the continent. I love what I saw, especially for the future. One of the slogans that I have said over and over again for a number of years is: "The rest of the world needs to learn to see Africa through the windshield, not the rearview mirror". Because that is going to be the true Africa, and it's all about them - how they develop. One of the opportunities I had was to meet the returning (Yali) fellows who were Nigerians. It was in some respects a sad occasion. I don't know if you remember, but the Nigerian Fellows lost one of their members here. But I had a chance to sit with them and talk with them. And afterwards I remember telling Jane, my wife – I said I have never in my life met a sharper group of young people anywhere – anywhere - than those particular folks. It just boosted me so full of optimism for Africa's future. Then I went back to Texas Tech and at Texas Tech - because I was vice provost for international affairs - I had an opportunity to manage the Young African Leaders / Mandela Fellows who came to our campus last summer. I had a chance not just to spend one session with them; I was with them every day. That reinforced for me the tremendous potential that is contained in these young people from Africa. At the same time, we all recognize that Africa has a generational problem - still some folks left, amongst the leadership, who are three, four times the age of their population. We can cite specifics – I'd rather not – but the transition is going on. We have seen dramatic transitions in last couple of years, and I know we'll see them over the next couple of years. These are the folks who are going to be in charge. I have absolute confidence in what they will do, as opposed to what has happened in some of the sad decades after independence. These types of programs help them. One of the most useful things is the connections that they can gather from these kinds of relationship-building programs. I don't know how many we have all together in Africa from the Yali networks, but it is huge. They are a ready network, and we are adding more and more all the time. So I think this is one of our most important programs anywhere - and especially needed for this place and time, given the demographics, the political developments, the economic developments. We will continue boosting it to the best of our ability. So you are optimistic about Africa? I am absolutely an optimist. It is interesting, because I taught on Africa. When each course comes to an end, one of the questions always is: "Are you an Afro-optimist or an Afro-pessimist? And why?" I have to say honestly that about 75 percent of the class ends up being 'Afro-optimist' - after 100 per cent having been 'Afro-pessimist' at the beginning. There are many, many reasons why we should all be Afro- optimists.